More Exciting Opportunities in Portland! 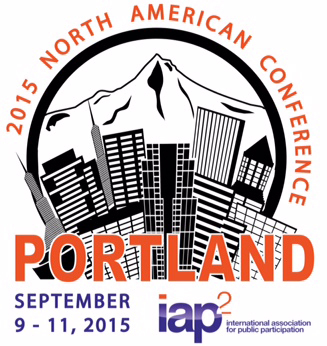 The 2015 IAP2 North American Conference is only 3-1/2 months away! It’s our annual opportunity to soak in new ideas and approaches, meet old friends and make new ones. There are four fascinating keynote speakers and 50 sessions, as well as a pre-Conference workshop you won’t want to miss: “Diversity, Equity and Inclusion, Portland-style” will go ahead on Wednesday, Sept. 9; the price is included in your registration fee. Check out the Conference webpage and the Schedule-at-a-Glance.